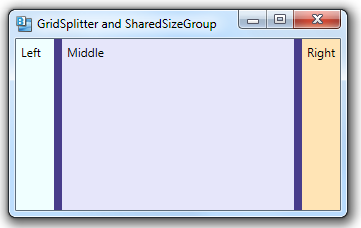 A GridSplitter allows a user to change the size of a row or column by dragging a visual splitter. 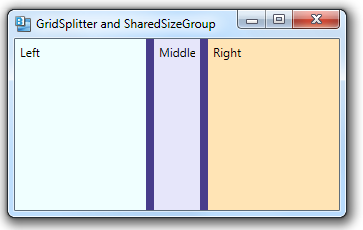 A SharedSizeGroup allows two rows or columns to automatically have the same size. You can combine these concepts, allowing a user to change the size of one column and have another column automatically have the same size. 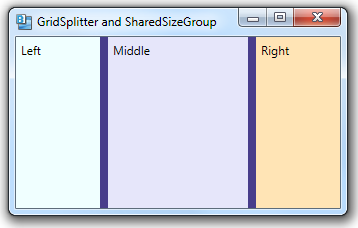 In the example below, the user can drag either splitter, but when dragging, the width of both left and right columns changes at the same time. User drags left splitter, which makes both left and right columns wider. User drags right splitter and columns also resize together.